Resolving to Tear. It. Up. I'm not big on New Year's Resolutions. Seriously, I have enough guilt already, I don't need to make myself feel even worse by failing to cease one of my (really not that bad) vices. Besides, when was the last time you ran into someone in August who looked all crazy fit and they said "yeah, it was my New Year's resolution to stop drinking, eat healthy, and go to the gym"? Don't lie, it was never. Because I'm working with a laughable budget and Matt is a genius with concrete, I'm guessing there's going to be a lot of this going on. Minus the lame bench and utterly useless mini-counter. Overt your eyes from the vassal sinks and focus on the counter, tub and poufy things. See, concrete, not so bad. Lemme tell you, I really don't like chandeliers in bathrooms. And don't try to sell me on those new-fangled chandelier shower heads either, they're even worse. It's like, I'm trying to relax and take a bath then BAMB! I'm assaulted with an electrocution fantasy. You're talking to a girl who shuts the toilet lid when she blow-dries her hair, so, nope, no convincing. Glass or fancy painted vassal sinks. Or any other vassal sinks. I'm ok with raised sinks, but no bowls, please. pedestal sinks. pretty, yes, functional, no. God give me the strength not to knock down all the walls in my home in order to achieve this look. Breathtaking. And, well, are we sure the kids will need cabinet doors? I'm going to pass on the clock and the embroidered "sanctuary" towels. Gross. Ok, you got me: it's not a bathroom, but that is EXACTLY what I want my shower curtain to look like. I love how the legs look all robot-y. Ok, ok, we're scratching everything and moving in a new direction: Gold Transformers! I want everything to look like a giant pixelated transformer dipped in gold. Where are my smelling salts??!! If I can't wrangle a bunch of shiny robot toiletries, this Starck tub should fill the void. Left: Murdock Young; Right: Sorry dude, I can't remember where I found this. Ok, so there's a tub on the left, but that oval glass shower is clearly the star. And yes, I know, I know, kids need a tub. What's with those babies, why can't they just shower like normal people? And get jobs? Note: that dolphin comes in gold. 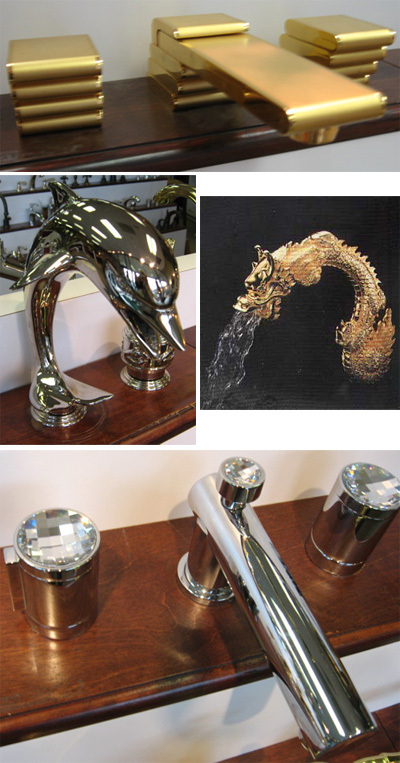 Who says no to a gilded dragon head faucet? A crazy mother with "professional architects" that's who. Whateves ma, you're going to be crying a river of tears when we have the renovation face-off. See, it's going to be great, so long as we get rid of every. single. thing. in there. There you have it, 2009 goal numero uno. Of course, if I were going to make a real-life, honest-to-gosh resolution, it would surly be one that all of you would appreciate: I would work on my spelling. But, hey, I've managed 30 years without knowing the difference between sense and since, what's one more?